Norman’s first experiment with etching was in 1897, twenty years before he became seriously involved with the medium. 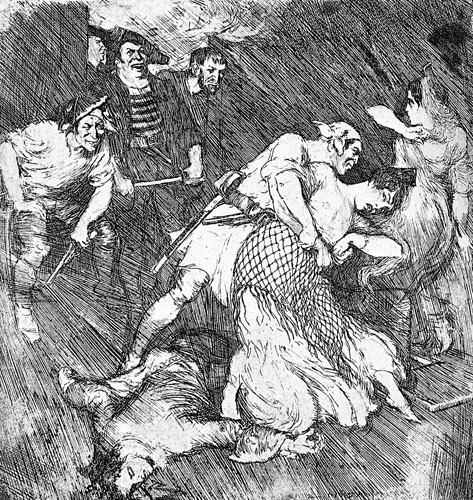 (Pirates’ Captives) was the result and depicts a robust pirate scene (rather reminiscent of a woodcut in style). ‘This little etching was done in the year 1897. My brother Lionel started etching at that time so I experiment with example of the Black Art’. This annotation appears below the image on the facsimile etching. The original etching was never published and the only original of this work is on view at the Norman Lindsay Gallery and Museum, Faulconbridge.